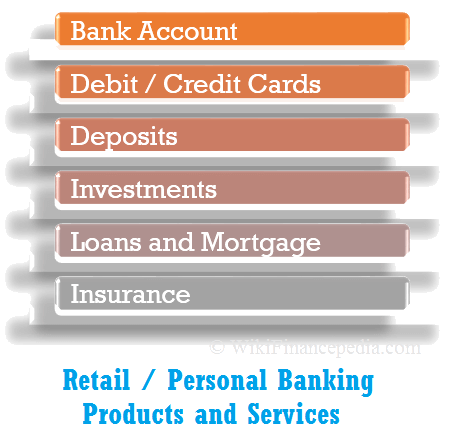 Personal Banking is also termed as Retail Banking. It is one of the types of banking products and services which are offered to retail customer. Services like personal loan, debit cards, credit cards, mortgage loans, savings etc. are offered by banks as a personal financial solution to the retail customers. In order to make a sound financial plan, one needs to know all the resources and available options. In general, people don’t have enough knowledge and failed to pick the best options they can opt for. So, while dealing with personal finance, it is important to know all the available banking products, options and resources one may have. A detailed study of every available option is required so that one can do the comparison and hence can select what is best for him. Besides saving account, there are several different types of bank accounts available. For example – 3-in-1 Account of ICICI bank, Salary Account, Pension Account, Child Education Plan (Minor account), Outward Remittance, Exchange Earners’ Foreign Currency Account, etc. Generally, bank has a solution of almost all requirements of individual, a family unit, as well as a business. So, it is always advisable to talk to the bank officials before you decide to go for any product. Ask them to suggest you best product for your need. Discuss the needs in details with them. 1. Debit Cards: The card which reflects your bank account. Generally, these cards have some or the other shopping benefits like cash back etc. So, just be aware of taking full advantage. 2. Credit Cards: Something to handle with care. These cards are like pre-approved bank loans which you can take it instantly when needed. Generally, people use it for shopping and pay the credit card bills before their interest starts (generally after 15 to 45 days). 3. Other Cards: There are several other cards such as Commercial cards, Prepaid Cards, Travel Cards, Unifare Metro Cards etc. And not only have this, each of these card types had further kinds of cards. For example – Travel cards have further cards like PayDirect Card, Pockets, Gift Card, Meal Card, Indian Rupee Travel Card, Saral Money Prepaid Card, Reimbursement Card etc. Fixed Deposit (without premature withdrawal facility). Thomas Cook Holiday Recurring Deposit. Tax Saving FD (Fixed Deposit). Derivative and Commodity Exchanges etc. Transferring of personal loan from high interest rate from one bank to another bank is now a common practice. Most borrowers are now choosing for a Personal Loan Balance Transfer to get low interest rate as a advantage in the market. 1. Life Insurance: Some popular plans are – term plans, wealth plans, retirement plans, child education plans. 2. Health Insurance: Just to cover up the medical bills and emergency medical help. 3. General Insurance: This is for the risk cover of property loss, such as home insurance, car insurance, factory or shop insurance etc. 4. Card Protection: This is for the protection against loss of different cards mentioned above i.e. credit card, debit card, loyalty card and membership cards etc. This is just an introduction to most popular and commonly used options and personal banking resources. There are still much more things to know. There is seriously a wide range of options available, and they are increasing as well as changing regularly. So, personal finance is a lifetime improvement demanding thing. I love to do creative things whether it maybe web designing, optimization or data integrity. Also I like to share valuable information across various good sites.